McCauley & Co.Todd Durkin’s Year-End Advice for Executive & Entrepreneur Athletes! - McCauley & Co.
It’s not enough to bring experience and expertise, more and more I’m seeing that besides having the talent to lead people to performance, my executive clients need to manage their energy within demanding roles. That means eat right, sleep enough, use your vacation time and work out! 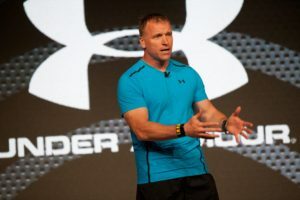 That’s why I invited Todd Durkin an internationally recognized strength, speed and conditioning coach, personal trainer, bodyworker and motivational speaker to share what he teaches his clients and how he manages his own energy. Yes, it takes discipline, but it doesn’t have to be at the expense of fun or other important things in your life. Here’s Todd’s take on energy management to create competitive advantage in life and work. “Successful people do the things that unsuccessful people don’t,” says Durkin. He swears by a morning routine (so does most every successful leader). Before he turns on his phone, he spends an hour dedicated to journaling and setting deliberate intentions for the day, a workout, and proper nutrition. Practicing this self-care every morning creates a solid foundation for the rest of his day. When fires happen later, it’s easier to respond calm, cool and collected. He’s brought this routine to his high-profile clientele of elite professional athletes. Including NFL MVPs, Super Bowl Champions, Heisman Trophy Winner, Olympic and X-Game Gold Medalists, plus many other champion athletes. Another important piece of advice – steer clear of energy vampires. Who are you spending most of your time with? The people you surround yourself have an effect, they either take away from or add to your energy. Durkin says he consciously chooses to spend time with people who uplift and inspire him, rather than negative individuals who drag him down. Greatist has named Todd one of the Top 100 Most Influential People in Health & Fitness for the past four years. You don’t get there by being a buzz kill! For people who want to workout but need help getting motivated, Durkin stresses progress over perfection. It’s OK to have cheat days, don’t give up… simply get back on course! The most important thing is making a start, and getting into a routine that you stick to. He recommends starting with 3 days a week, for 20-30 mins to increase your overall energy and performance. And Todd continually proves his theories, his gym Fitness Quest 10, has been named as one of “America’s Top 10 Gyms” by Men’s Health for the past 5 years! In addition to high-profile athletes, they attract fitness enthusiasts of all ages, shapes, sizes, and levels who want to improve their overall health and fitness performance. For more inspiring life and fitness hacks from Todd Durkin, visit his website: www.todddurkin.com.